He called me personally—I just picked up the phone and the voice came on and said, “This is Jack Kennedy, Bernie. How are you doing and what are you going to do now?” I told him that I was going to go back to my business which I had been neglecting because of politics! And he told me, “Well, I don’t want you to do that.” He said, “You make arrangements so that you can be away from your business because I want you to come to Washington to work with me,” and, of course, I didn’t need much persuading. I thought so highly of him that I wanted to be part of his administration and readily agreed to do it. Boutin served as Deputy Administrator and then Administrator of the General Services Administration. He was generally praised for his work in those positions, part of which involved collaboration with Mrs. Kennedy on the renovation of Lafayette Square in Washington, D.C. The quotation above is taken from Boutin’s oral history interview, the rest of which can be viewed here. JFKWHP-AR7432-A-1. 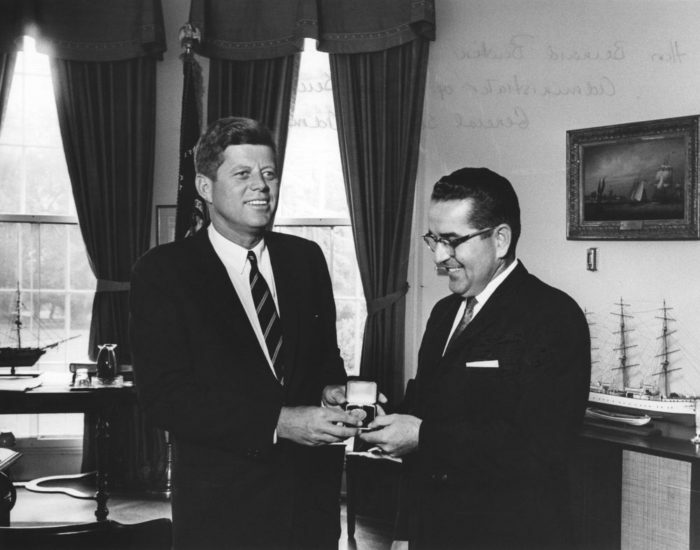 President Kennedy with Administrator of the General Services Administration, Bernard L. Boutin, 28 August 1962.